https://soundcloud.com/perseus-traxx graces Distant Worlds with our fourth transmission and this one is a real journey through space and time, beautiful ear-worm melodies aplenty, fuzzy tape warmth, real machine soul for your listening pleasure... "I refuse to deliver a biography written in the third person. 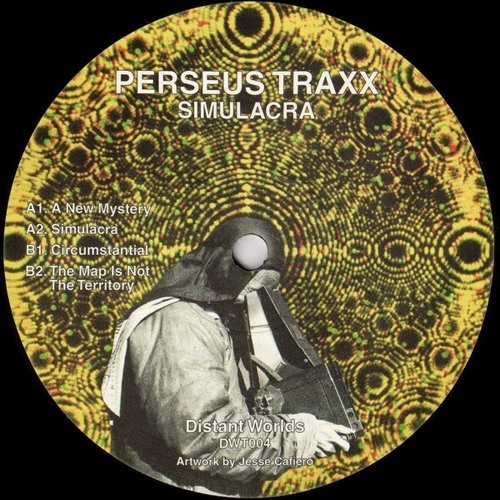 Perseus Traxx is one of a number of different projects and aliases born from differing themes and ideas, be they mythological, fantastical, conspiratorial or otherwise. Others include, but are not limited to: Northern Powerhouse, Nite Vision, Orpheus, Sir Leon Greg, Operator Tracey, Scandalous Arthur, Orpheus, Ellis de Havilland and Vulcano. I self release music and communicate with people and since doing that a range of quality labels has had faith in what I do, enough to make the gamble of releasing my music in a physical format. Such labels include Den Hague's legendary Bunker, as well as M>O>S and BOE Recordings. Have a look on Discogs if you're interested in reading a list of what I've done, the cross referencing and digging potential of the site, to allow discovery of artists, labels and releases, is something I actively encourage. Curiosity often pays off and an active approach is far superior to waiting around to be fed information. This record uses a Juno Alpha and a Yocto, along with other bits I can't remember. It was made after I returned from an inspirational trip in Southern Italy in 2017."